In this Modern Enterprise environment, Datacenters are occupied by hardware and software components from multiple vendors. Even some companies have hardware from multiple vendors like HP, DELL,Cisco etc and even mutli vendor hypervisors like vSphere, Hyper-V, Cirtix ZEN, Redhat KVM. How do you manage and provision using all this platform. It is real pain of using multiple admin portals to manage and provision. 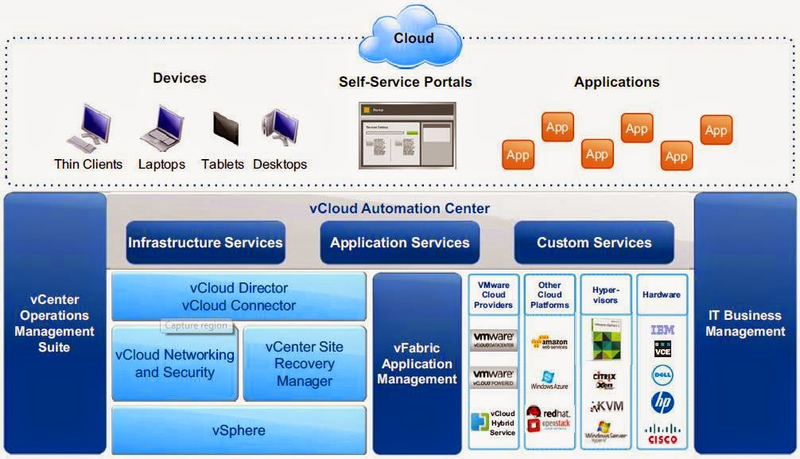 vCloud Automation Center provides a secure portal where authorized administrators, developers or business users can request new IT services and manage specific cloud and IT resources, while ensuring compliance with business policies. Requests for IT service, including infrastructure, applications, desktops,and many others, are processed through a common service catalog to provide a consistent user experience. Apart from the above list, You will be able to manage various custom endpoints like Active directory. 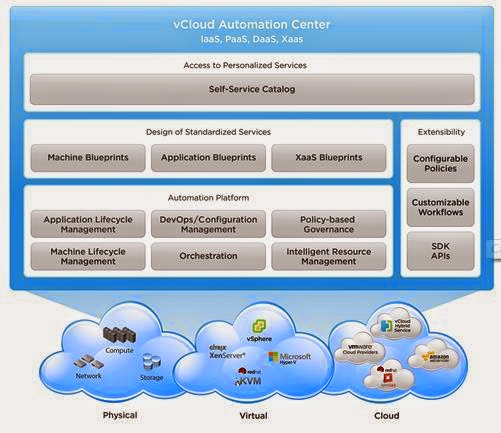 vCloud Automation Center enables IT administrators to extend out-of-the-box capabilities. IT administrators can either integrate these capabilities with existing tools and infrastructure or new IT services by leveraging VMware vCenter Orchestrator library workflows and partner-provided plug-ins. vCloud Automation Center is a purpose-built, enterprise-proven solution for the delivery and ongoing management of private and hybrid cloud services, based on a broad range of deployment use cases from the world’s most demanding environments.